14W has weakened into an area of low pressure. 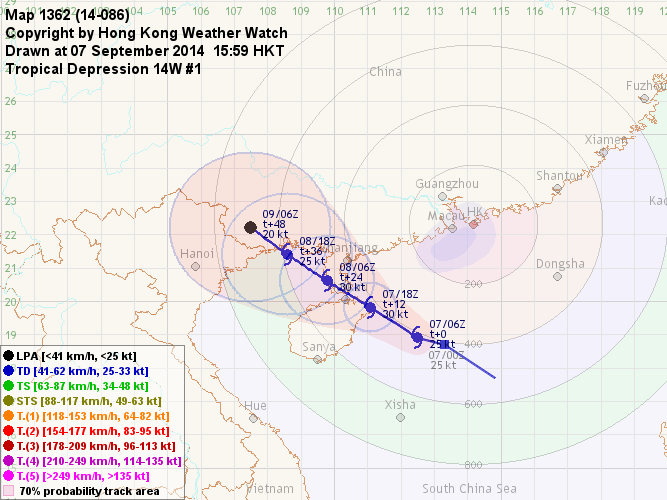 At 8 pm, 14W was centred about 470 km (250 NM) W of Hong Kong. 14W is expected to move further inland and dissipate. Due to the lack of moisture, 14W will weaken rapidly. This is the final bulletin on 14W. 14W is approaching Leizhou Peninsula. 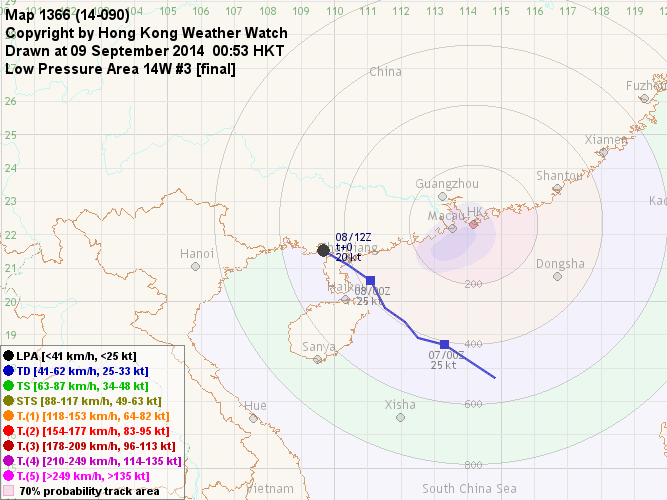 At 8 am, 14W was centred about 370 km (200 NM) WSW of Hong Kong. The #1 Standby Signal was cancelled at 9:10 am. 14W is located in the western periphery of the subtropical ridge, and is expected to move NW or NNW into western Guangdong and eastern Guangxi. 14W's convections are still severely sheared. The storm is expected to weaken after making landfall. Although 14W is retreating, showers are still expected today. The weather will improve tomorrow as the subtropical ridge assumes influence. A tropical depression has formed within the South China Sea, and is given the number 14W by the JTWC. 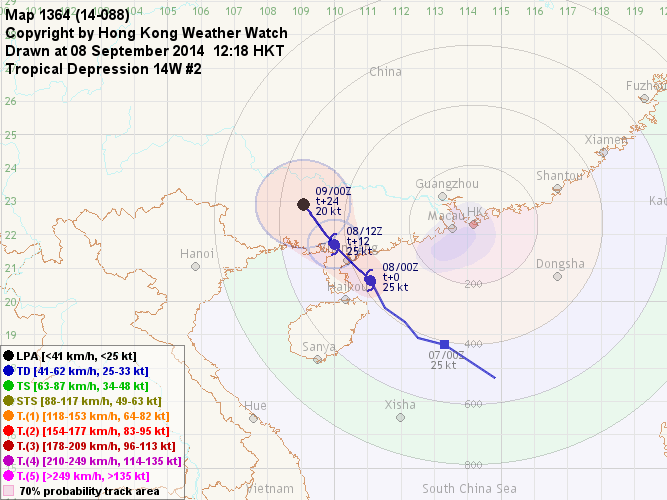 At 2 pm, 14W was centred about 420 km (230 NM) SSW of Hong Kong. The HK Observatory issued the #1 Standby Signal at 9:40 am. 14W is located in the southwestern periphery of a subtropical ridge, and is expected to move WNW or NW towards western Guangdong and Hainan Island. 14W is at its formative stage and its convections are sheared to the west. As it is expected to make landfall tomorrow, there isn't much room for intensification. Fresh east to southeasterly winds are expected tonight and tomorrow, and may reach strong force in offshore areas. There will be a few squally showers. 14W will maintain considerable distance from Hong Kong throughout the forecast period, and significant effect is not expected.